Many professional sportsmen and women dedicate every waking moment to practising their sport when they’re not competing. 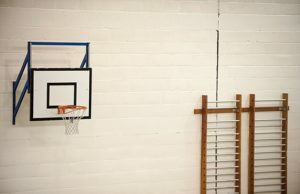 Nothing makes practise more perfect than finding sports facilities that can offer the right equipment, at the right time. The same applies to sports teams of all types. From archery to football, rugby to hockey, track and field to boxing. However, finding spaces for regular sports training and training camps can be difficult. The most obvious venues, like sports centres and playing fields, may be expensive. Theywon’t necessarily provide all the facilities needed for every single sport. It therefore pays to think outside the box when looking for a training venue. Schools have to cater for a wide range of physical activity for their students, including numerous extra curricular sports. Most therefore have the equipment and spaces needed for most popular sports already on-site. From AstroTurf floodlit football pitches to all-weather basketball and tennis courts, there are very few other types of venues that can accommodate such a variety of sports on one site. 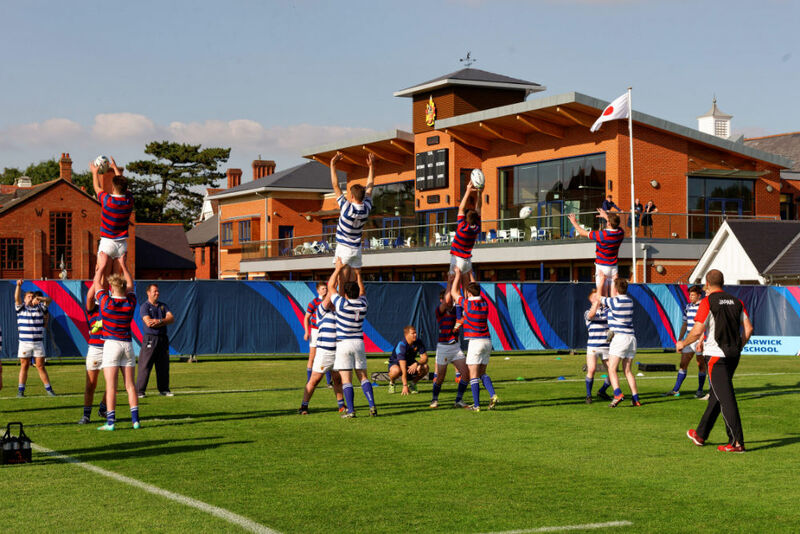 Tonbridge School Centre in Kent is a stunning sports facility that takes training to a professional level and beyond. The world-class Athletics track was the chosen as the pre-2012 Olympics training venue for Athletics Australia, and the six-lane track has been used by Olympic gold medalist Dame Kelly Holmes for training. Field athletics teams can train here for track and field events including discus, javelin, shot put, high jump, long jump and pole vault. Players and teams need to practise on a pitch or court that is as close in size to the real thing as possible, to get the most out of their training. Most schools usually have large grounds so, whatever the size of the team, there is plenty of space. Every sports team or individual athlete will have the freedom to practice every move on a full-size court, pitch or track appropriate for their sport of choice. The cricket pitches at the Reading Blue Coat School are truly exceptional, and it’s little wonder that with such great lawns, the school teams win a mass of silverware each year! The school also has extensive football and rugby pitches, plus a fully equipped gym for off-pitch cardio training. Situated right on the River Thames close to Sonning Lock with its own boathouse, the Blue Coat School also offers direct river access for rowing teams. Training is hard work, so it’s unsurprising that after training, players will want to hit the showers as soon as possible. All schools, particularly those with a focus on sport, will have clean, changing rooms with showers and in some cases, extras such as steam rooms. With on-site facilities, players and athletes can start their cool down process almost as soon as they step off the pitch, making the training experience more effective in preventing muscle damage and strain. Cheltenham Ladies College has a sports centre available for hire that rivals the best in the country. 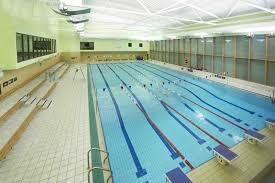 One of the exceptional facilities here is the state-of-the-art 25m pool. 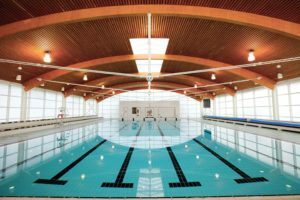 With its elegant wooden barrel roof and floor to ceiling glass walls, this is a pool to inspire future champions. Thanks to its ozone cleansing system, no swimmer need smell of chlorine or suffer stinging eyes ever again! Swimming teams can also work on their physical fitness in one of two gyms, or in the weights room. It’s the extras a venue can offer to individuals or sports teams that can make training more efficient and effective. For long training sessions, players will need to stop for breaks and food. Having catering facilities on-site is far more preferable than having to transport the whole team to an alternative venue just for meals.  Independent schools will have the facilities in place for catering for large numbers at a time, so accommodating a sports team should be simple in comparison. Summer is the off-season for many sports, meaning it is the perfect time to concentrate on team training sessions. It is also holiday time for schools, so facilities are available all day, every day, for several weeks. Boarding schools are great venues for team summer camps as they offer on-site accommodation and catering, reducing travel time for teams. At Felsted School in Essex, the extensive astro turf and grass floodlit pitches allow training to extend beyond daylight hours all year around. What could be more inspiring than training on the hockey pitches in sight of the magnificent buildings at Felsted, effortlessly combining competition and tradition in one location! In addition, the onsite gym has a weight training room, cardio suite, core training area and a combat training room, plus the services of a sports massage therapist, to help any team train to international standards. Need A Special Space To Train? Call us – we’ve helped many sports teams find the best place to train, from international rugby squads to football stars of the future.